I've been working on another set of Megaman theme skins, with the gimmick for mine being that they are all stages from Megaman 1-3. Would you mind if I based my map skin off of yours? I'm having a hard time coming up with ideas for a few objects. Yeah, feel free to go ahead. Here's the progress I've made for the night. I really think theming this as the closest to a Smash Bros. skin set could really be neat, and I'd like as much help as possible with it. TheomanZero, Dimpsy and Alkerion like this. Couldn't seem to find any animation frames for the water or lava. If you can help out, please, PLEASE help. I'm not gonna be able to get this thing done myself. Dochobin and Mitewing like this. BTW the font used is Emulogic which is basically NES font. TheomanZero, ThomasMink, Dimpsy and 3 others like this. It'd probably be smarter if you used size 6, not 12. Map skin based on the "Wario Bike" souvenir in Wario Ware: Twisted. Still, I love the idea of a GB Zelda skin. Mitewing, TheomanZero, ThomasMink and 2 others like this. and possibly make the Bullet Bill cannon green. Otherwise, it's good. Mitewing and MissingNo2 like this. I originally made the cannon blue to match the skull, but I've changed it back to green. Also, I had tinkered with the idea of using that block, or a custom ? block, but in the end I decided to go with the egg block, since it seemed to fit more with the feel of the game. ThomasMink and uglyrodent like this. uglyrodent, ThomasMink, Develon and 2 others like this. If you were notice, the castles in the original (as seen here) have a darkest shade, which in SMBC in different. Notice how in SMAS, Mario starts at the actual castle door and not to the right of it. Different colored flagpoles (unnecessary, but I don't want it to go to waste). 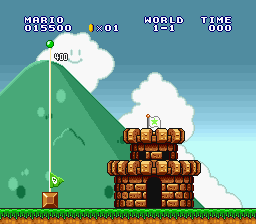 Got rid of part of the 8-bit big castle, as it is in SMB (the levels can display two background object sets, for levels with big castles, on of them is the castle wall from World 8-3, which is placed around the castle, which explains why the rest of the castle after the flagpole is continues). Added two separate flags, one would be invisible in the skins, so the flag would be able to flow in each direction. Also, the yellow flags have 4 frames (technically 8, but the latter are identical, i.e. 1-2-3-4-1-2-3-4). The animated cloud from the level preview (to be used when it is added.) (The animation is 8 frames in SMAS, which has each frame play twice, one after the other, i.e. 1-1-2-2-3-3-4-4). 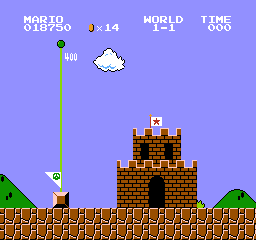 Replaced the recolored flagpoles with the unused climbable pole and it's alternates in the "Super Mario Bros. Utility". Keep in mind SMBC uses the NES version of SMB as its base, and the SMAS skin simply makes the look like SMAS, it doesn't turn it into SMAS. There are some changes between the two we simply can't imitate, such as the castle position at the end of a level or Mario's starting position at the beginning of a level. Couldn't you just shift the SMAS castles over 8 pixels in the template? 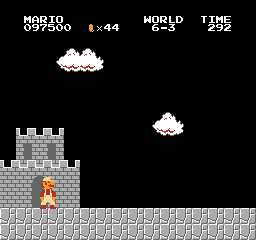 There isn't room to shift them over that far, and even if we did, Mario would enter the castle half a tile too early. That's exactly how SMAS is supposed to make it. It was shifted 8 pixels to the right. 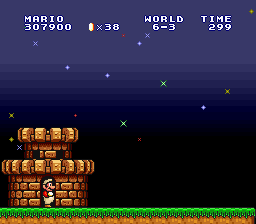 Then just shift the 8-bit ones half a tile to the left, reposition everything in the levels and make it so that Mario enters at the set part of the castle sprite exclusive for all skins. Problem solved. I'm not going to reposition everything for one skin. ThomasMink, uglyrodent, Mitewing and 1 other person like this.